Will be a loved and loving wife. Birth stone poem by and unknown author from the Gregorian Calendar, published by Tiffany and Co. in 1870. 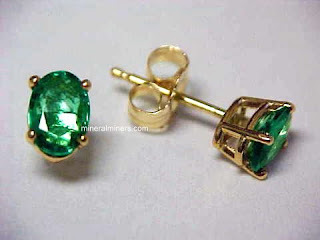 Sparkling with a rich grass green color, emeralds are highly valued for their fascinating earthy beauty. Emeralds are a relatively hard stone at 7.5-8 on the Moh's scale. They are a member of the Beryl family of minerals with their rich color caused by the presence of chromium and iron. 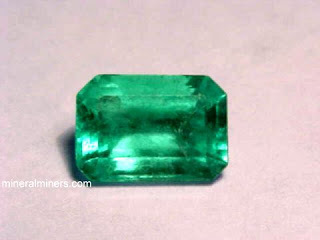 Emeralds usually contain inclusions which are not considered flaws. 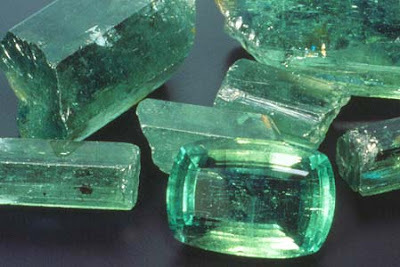 Quality emeralds are mined in Columbia, India, South Africa, Russia and Afghanistan. Tradition holds that emeralds enhance the wearers clairvoyant ability. The strongest time for the powers of the emerald is said to be spring. They are also worn to promote healing, love and contentment. Emeralds are considered good for eye ailments. Just gazing at the clear green colored stone is said to ease eye strain and cure headaches. Emeralds were highly prized in ancient Rome. They were worn as a talisman by the Roman Goddess Venus to represent faith, goodness and kindness. Emeralds were Cleopatra's favorite stone. She gifted visitors to her court with an emerald engraved with her likeness. Egyptian mummies were buried with emeralds engraved with the symbol for foliage to represent eternal youth. Clean emeralds with a soft cloth and mild solution of soap and water. Avoid ultrasonic cleaners as most emeralds are oil treated for color enhancement. The FamiLee jewels do not currently sell emerald gemstone jewelry, but we love to wear it! Green is my favorite color and emerald is Melissa's birth stone so I get to wear it in my mother's ring every day. I love them too and was lucky that they are your birthstone so I do have a couple.